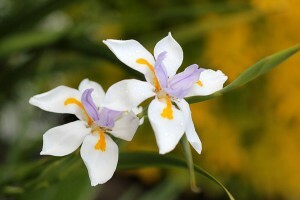 Another favourite indigenous (native) plant I have in my garden is Dietes or “wild Iris”. 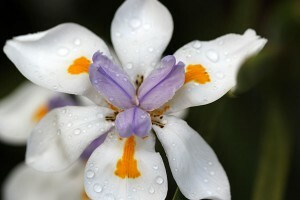 Perennial, evergreen plants which grow in large clumps, I have Dietes Grandiflora and Dietes Bicolor. 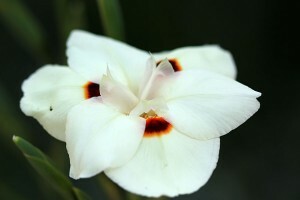 Both are super easy to grow and care for, devoid it seems, of any attack by bugs and disease. I love the spikey upright foliage that remains a feature in the garden throughout the year and the flowers in spring and summer are delightful. I am particularly fond of Dietes grandiflora with its bright white flowers, yellow/orange markings and purple central segments. The leaves are dark green and can reach up to 1.5 metres in length. The plant seems to flowers en-mass at certain periods, especially after rain in summer (hence all the rain droplets on my photos ). The individual flowers don’t last more than a few days but the plant bears so many flowers during the peak periods, that it really doesn’t matter. 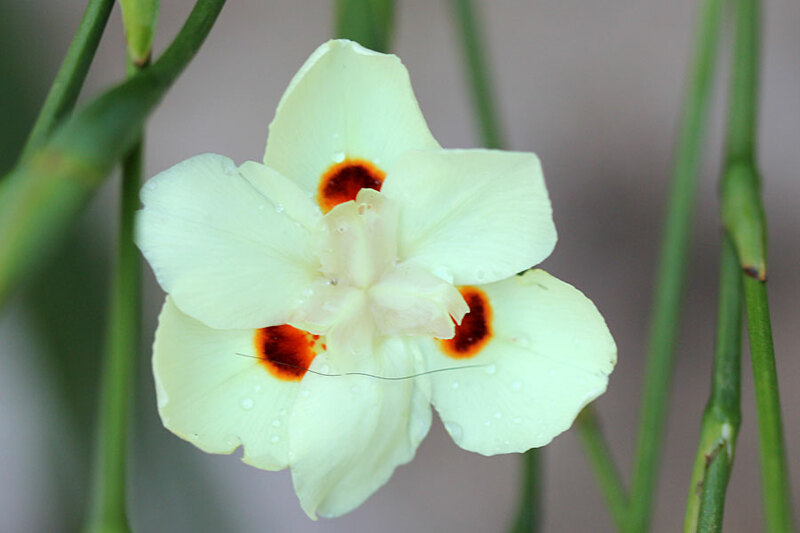 I have it growing in full sun as well as in partial shade – it does very well in my back shade garden and I highly recommend this plant to local gardeners – this one is a winner! Commonly known as Yellow Wild Iris or Peacock Flower, Dietes bicolor also forms clumps of erect sword-shaped leaves that provide a great foliage contrast in my garden. The flowers are about 60 mm in diameter, flat, light yellow with brown markings and only last a day, but it doesn’t really matter as it flowers non stop it seems, from about October through to May. It does well in a sunny position but is also thriving in my shaded back garden. Another winner for local gardeners! Stunning flowers and photo’s Christine! Christine: when you show these beautiful blooms, could you also include a shot of the plant itself? Seeing a single bloom close-up is great, but I’d also like to see what it will actually look like in a garden bed. Thanks! Alan mine has just burst into such exuberant bloom that I battle to get it all on the camera. It grows like America’s walking onions, flings its arms out and roots from the elbow. They say … the plant can anticipate rain, blooms before the rain actually arrives. HUH. We got almost a millimetre of rain. Thank you.